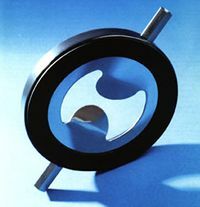 Twenty-five years ago Westfall made a simple orifice mixer—a plate with a small round hole and an injection port. Today Westfall’s high shear static mixers feature a sophisticated geometric opening with bent tabs that create rapid turbulence within a limited lay length. This new breed of high performance static mixer is increasingly chosen by engineers around the world, because of the high shear performance, low cost, low maintenance and ease of installation. Our best seller, most often used for mixing hypochlorite into potable water. Advanced use includes rapid mixing of oil and water at well sites, and injecting nitrogen to remove oil from water. When precise sequential additives are required. Includes 2 plate mixers—one fixed and one rotating. All our Static Mixers, DE Filters and Venturi tubes are custom engineered and manufactured. We still save you time and money.